'Vivian Maier' Brings Nanny-Photographer's Life Into Focus In 2007, filmmaker John Maloof bought thousands of undeveloped negatives at an auction. 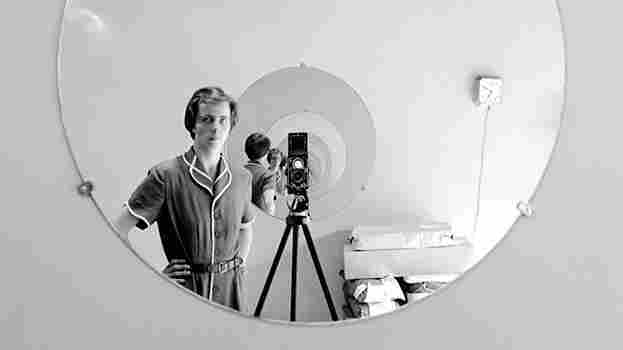 Now, he and Charlie Siskel present Finding Vivian Maier, a film about the reclusive woman behind the photos. In their new documentary Finding Vivian Maier, John Maloof and Charlie Siskel profile a reclusive photographer and her undiscovered photo archive. Is an artist's life relevant to her reputation as an artist? Not so much, perhaps, but many of us want the bio anyway, especially when the artist in question is as tantalizingly elusive as Vivian Maier (or Mayer, or Meyer, as she variously spelled it to confound the curious), a reclusive Chicago nanny whose posthumously discovered trove of street photographs swelled into a cause celebre after her death in 2009. The lucky, sharp-eyed finder of the stash was John Maloof, a photographer and flea market regular who paid $340 for more than 100,000 mostly undeveloped negatives while researching a local history project. He must be a lot richer now, but having tried to persuade initially indifferent art museums to exhibit Maier's work, Maloof and his co-director Charlie Siskel (a nephew of the late film critic Gene Siskel) set out to learn what they could about a woman who seemed to have no interest in sharing her work, still less in courting public recognition. The resulting documentary, Finding Vivian Maier, might better have been titled Constructing Vivian Maier — not because the filmmakers came up empty-handed, but because what they found out sheds too neat and tidy a light on her unsparing, yet warmly sympathetic portraits of the denizens of Chicago's seamy underside. From Web research and interviews with Maier's employers and former charges (some of whom, fancifully or not, claim friendship with her), Maloof learned that though she was born in New York in 1926, Maier affected a "fake" French accent. Then again, her mother was French and she spent chunks of time in the Alsatian village where her mother grew up. Her father barely enters the picture, which may or may not have anything to do with her reported antagonism toward or fear of men and the fact that she never married or, apparently, had an intimate relationship with a man. Maier was devoted to the children she cared for, but she could also be harsh. In the selfies she occasionally took with her Rolleiflex camera, she stands more than 6 feet tall. Her lanky stature and unsmiling stare inevitably invite comparisons to Mary Poppins — the P.L. Travers rather than the Disney version. One former charge reports being force-fed by Maier; others call her mean or complain of being dragged around Chicago's slums while she searched for subjects. You'd think one or two of them might have been entranced — even enhanced — by jaunts that took them into more exciting terrain than their safe suburban habitats. Maier was certainly a pack rat who grew more secretive as she aged out of her job into a lonely old age in which only the largesse of two of her former charges kept her from full vagrancy and untreated mental illness. But the filmmakers also pump her up as a woman of mystery, making much of her hermit nature and assuming she didn't want to be discovered. Perhaps she just loved taking pictures; perhaps they kept her company or even prevented her, for a while, from falling apart. Perhaps it never crossed her mind that she was an artist. Perhaps, had she lived long enough to witness her fame, she'd have reveled in the attention and ended up on Jeopardy or Dancing With the Stars. Recluses make great repositories for our projections, not least among them the common fantasy of unacknowledged creativity that brings us fame after we die. In the end, though, it's the work that thrills. The everyday quality of Maier's photographs in an age of sensation may have made the art world skittish for a while, though surely the fact that she was an unhip unknown in that world didn't help. Now Maier is a bona fide star, admired by major photographers like Joel Meyerowitz and Mary Ellen Mark. Her feel for the grotesque or bizarre has led to comparisons with Diane Arbus, while her radar for the urban dispossessed — an African-American boy on a horse in the city, the scrunched-up face of a toddler screaming in his stroller, a laborer with a face as cratered as the Grand Canyon — reminds many of Robert Frank. But her eye is all her own, enlivened by a mix of sly humor and fellow feeling that make it easy to see why the public flocks to see her work. Self-taught and roaming free in the city, Vivian Maier captured the remarkable in the ordinary.